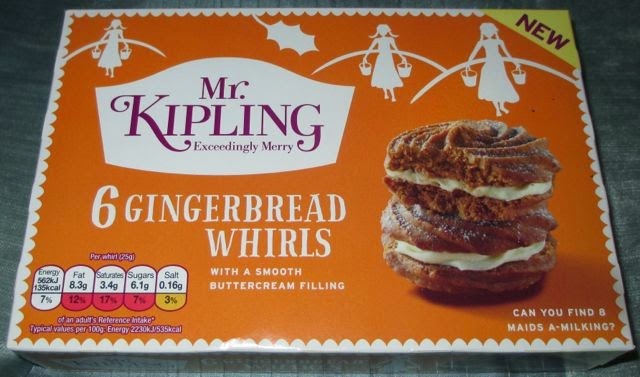 When I saw these in Tesco, I thought they sounded like a lovely autumnal twist on the regular Viennese Whirls from Mr Kipling. Once home I realised that the packaging had girls with buckets on them, milk maids… there were eight of them. Then I spotted the holly silhouette put two and two together with the “eight maids a milking” and the realisation hit me that this is the first Christmas review of 2014, sorry folks, we haven’t even covered Halloween yet! There are six Whirls in the box, and they have a fabulous orange brown colour to them, with a good portion of buttercream holding the two halves together. They are dusted with icing sugar, which looks pretty. 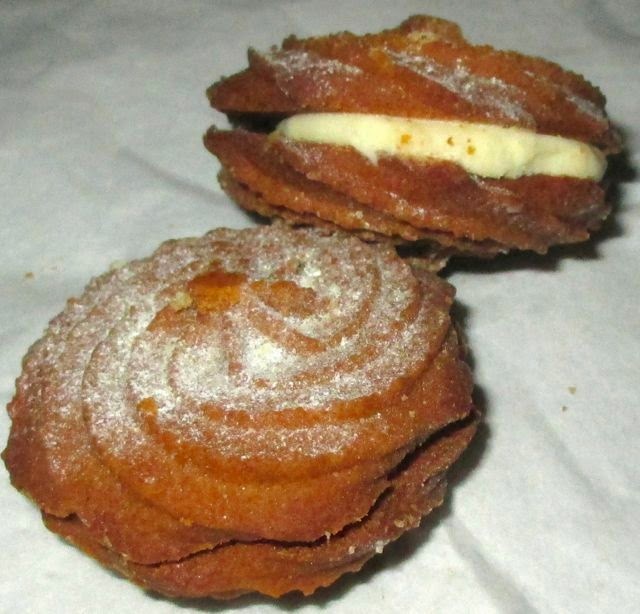 The initial flavour of these whirls are creamy soft tones, quite similar to the regular Whirls. After a moment the ginger kind of sneaks up on you and gives a kick of winter warming heat. I thoroughly enjoyed the spicy flavour, and the balance of sweet and heat was spot on. The mellow flavour from the middle just added that nice bit of calm to the spices, which was needed. You would be surprised by how long the tingle of ginger flavour lingered on the palate. They did taste christmassy, but these would be just as good for warming yourself up with a cocoa on a cold autumnal night, and perfect as an after fireworks treat. So don’t rule these out to December, they are too good for that!